A U.S. trade tribunal on Friday threw out Boeing’s case against the Bombardier CSeries jet and quashed the prospect of tariffs that would have closed the U.S. market to the Canadian aircraft. Boeing’s aggressive effort to keep Bombardier’s small CSeries jet out of the U.S. market failed Friday when a federal trade tribunal unexpectedly rejected its case and quashed the prospect of crippling tariffs against the Canadian manufacturer. Indeed, the legal attack may have backfired on several fronts. Boeing’s strategy antagonized the governments of Canada and Great Britain, where CSeries factories are located, and put at risk major Boeing defense contracts from those countries. It also alienated top customer Delta Air Lines, blocked from buying the CSeries by the proposed tariffs. And the severe pressure on Bombardier helped seal its decision to sell a majority stake in the CSeries to Boeing’s archrival, Airbus. The four-person U.S. International Trade Commission (ITC) ruled unanimously that Boeing was “not materially injured or threatened with material injury” by Bombardier’s sale of the jet to Delta. The surprise result killed a proposal by the U.S. Commerce Department to impose tariffs quadrupling the price of the jet for U.S. airlines. In a preliminary ruling in June, the ITC found that Boeing presented “a reasonable indication” of harm to its business, so the Commerce Department proceeded to propose the tariffs, pending a final decision. Friday’s outcome is a stunning reversal. “It is also a victory for U.S. airlines and the U.S. traveling public,” Bombardier’s statement added. Boeing argued before the ITC that the CSeries was first developed and then later saved from complete financial collapse by large subsidies from the governments of Canada and the United Kingdom. The jet is assembled in Mirabel, Quebec. Its wings are built in Belfast, Northern Ireland. Boeing also claimed that Bombardier was guilty of “dumping” the aircraft in the U.S. market by selling 75 of the jets to Delta in 2016 at a very low price. Bombardier countered that because Delta at that time was explicitly looking for smaller airplanes, Boeing hadn’t even proposed its own jets in that sales campaign. 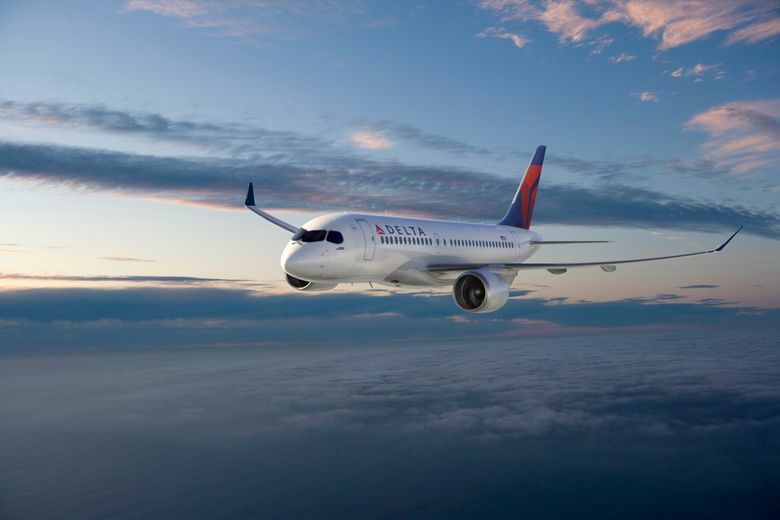 Bombardier had offered Delta the CS100, which has 110 seats, smaller than any plane Boeing builds. In response, Boeing offered Delta some used 106-seat E190 jets made by Embraer of Brazil that it had obtained in a trade during a sale of its own jets to Air Canada. In a subsequent sales campaign where Boeing had much more at stake, Delta in December chose Airbus over Boeing for an order of 100 jets worth more than $5 billion. The ITC is an independent commission, appointed by the government and evenly split between Democrats and Republicans, that is charged with investigating the effects on U.S. industry of dumped and subsidized imports. In this case, the commissioners ruled to reject the determination of the Commerce Department, which under President Donald Trump has taken a new, confrontational line on many trade issues — including repeated criticisms of Canada over lumber imports and the North American Free Trade Agreement. The four current commissioners were appointed by presidents Barack Obama and George W. Bush. T. Augustine Lo, an attorney at international law firm Dorsey & Whitney in Seattle, said their vote vindicating the CSeries is a major blow to the anti-free-trade tendencies that have been growing in the U.S.
“The Trump administration’s rhetoric against foreign imports has suffered a major setback today because of the checks and balances in our legal system,” Lo said. The ITC decision means Delta’s first CSeries delivery, which had been set for April but was on hold, can now go ahead. In an interview two weeks ago at Boeing’s Chicago headquarters, Chief Executive Dennis Muilenburg dismissed a suggestion that Bombardier is too small a player and Canada too small a market to be a real threat to Boeing. Standing on that principle now looks costly. For Airbus, which by year-end should own a majority of the CSeries program, the ITC ruling counts as a big win. After stunning the aviation world in October with its deal to bail out Bombardier by acquiring a majority stake in the CSeries, Airbus announced it will build an assembly line in Mobile, Alabama, to build the planes for the U.S. market. It has options to buy out the smaller CSeries stakes of Bombardier and the government of Quebec, meaning it could take full ownership around 2026. Yet when Bombardier was looking for a savior last year, it could have been Boeing instead of Airbus. The Canadian government, keen to rescue Bombardier, invited Boeing last summer to discuss some resolution of the trade dispute and a possible CSeries partnership. But according to people with knowledge of those talks, Boeing was never really interested and, after polite discussions, walked away. The implicit message was anything but polite: See you in court. Now that court has delivered its verdict, and Boeing lost. The CSeries is an all-new, small single-aisle jet family with a five-abreast passenger cabin that’s offered in two models: the CS100, seating 100 to 135 passengers, and the larger CS300, seating up to 160 passengers. It’s optimized for the smaller end of the commercial-airliner market, with carbon-fiber composite wings, a metal fuselage and new Pratt & Whitney geared turbofan engines. With Airbus set to close its deal for the CSeries, Boeing is currently negotiating a possible agreement to acquire all or part of Bombardier’s rival, Embraer of Brazil. There’s just one possible silver lining for Boeing in Friday’s outcome. The U.S. trade-court decision may ease tensions that had developed over the case between the U.S. and its two close allies, Canada and Great Britain. Because of its displeasure over the previous CSeries rulings, the Canadian government had put on hold an all-but-completed deal to buy Boeing F/A-18 jet fighters valued at $5.2 billion. However, it’s unclear if the CSeries court victory will save that sale for Boeing.